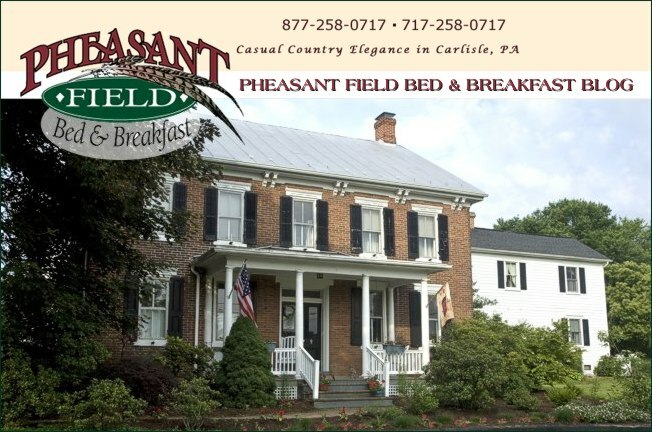 Here at Pheasant Field B&B, we offer overnight boarding for guests traveling with their equine friends. Sometimes we get special equine guests because of this special niche market we serve. Several years ago, we hosted the Royal Lippizaner Stallions when they were performing in the area. A year ago, we hosted "Hercules", the Guinness Book of World Records tallest horse. Earlier this month, we hosted 5 of the Budweiser Clydesdales as they moved between the different Busch farms located in MO and NH. These are beautiful, huge horses. We were honored to host them and their human travel partners, Bill & John. Thank you, Bill & John for choosing Pheasant Field as your rest stop for the night!